Owing to globalization and integration of financial markets across the world, coupled with increased cross-border flow of capital, there has been volatile movement in currencies. This extreme fluctuations in currency prices necessities Indian Corporate and Traders, including Importers, Exporters, SMEs/ MSMEs, Banks to adopt adequate Risk Management measures to protect currency risk. 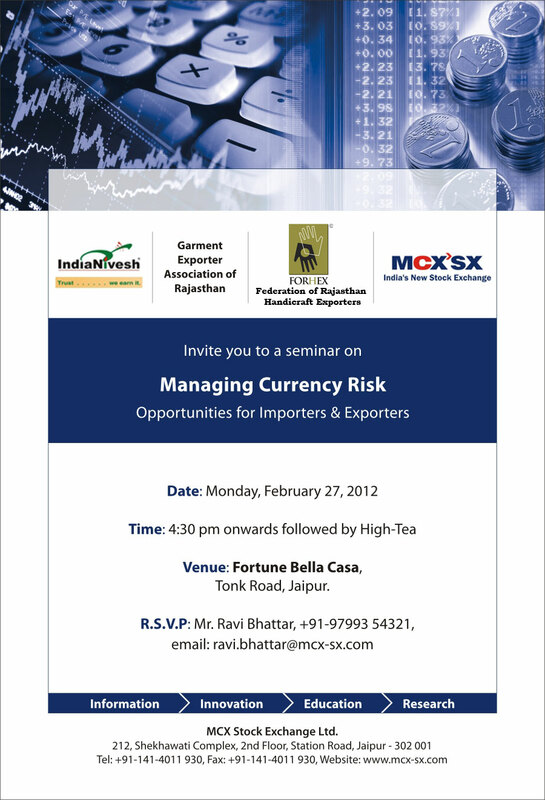 In an attempt to explore into what the future roadmap should be for Indian businesses for hedging risks against unpredictable currency movements, MCX Stock Exchange (MCX-SX) and India Nivesh is jointly organizing this seminar for GEAR and FORHEX.